Raspberries are an edible fruit that has a bittersweet taste. It is used in cakes, sweets, jam, and in the production of juice. Raspberry cocktails are a popular alcoholic beverage. Freezing raspberries is recommended for long term storage. 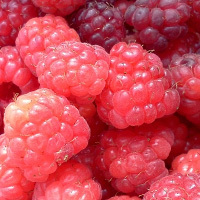 The calories in Raspberries per 30g(10grains) is 12 calories. Raspberries is calculated to be 41Cal per 100 grams making 80Cal equivalent to 195.12g with 3.06g of mostly carbohydrates、0.33g of protein、0.03g of fat in 30g while being rich in vitamins and minerals such as Vitamin C and Copper.